THREE RIVERS, Calif. — As you walk through a giant forest of solemn silence, the only sound is the one coming from the crunching leaves on the floor. Suddenly, you hear it. A twig cracks and you catch the slightest glimpse of a bird’s wings flying away. After that, back to total stillness again. Although Sequoia National Park is so silent that it seems to be uninhabited, it is actually home to more than 350 species of animals that range from birds and fish to mammals, insects, amphibians and even reptiles. The park makes a difference between native species and non-native species, which are those exotic species that have been introduced into this environment either accidentally or deliberately by humans. Sequoia National Park has 331 native species and 32 non-native species. One would expect the park to be overflowing with animal presence and, thus, numerous opportunities to take candid pictures of the riveting wildlife. However, that is not exactly the case. The park is rich in fauna indeed, but due to the fact that most of the species are unaccustomed to human interaction, they retreat to the deepest corners of the forest preventing themselves from getting exposed. With 404,063 acres to play in, species become naturally introverted but they do exist. 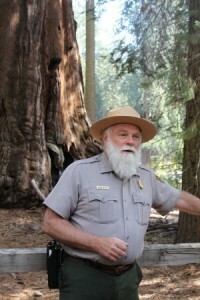 Park Ranger Frank Helling explains how the species co-exist with the flora and the climate at Sequoia National Park (Photo by Donatella Vacca). “Visitors will mostly see chipmunks and Douglas squirrels, also called chickarees. Mules are pretty common here, too,” he said. Helling explained that Sequoia and Kings Canyon National Parks are abundant in bears, however, these species, although curious, would rather stay unseen deep in the safety of the forest. Helling said that there are more chances of spotting bears in Sequoia rather than in Kings Canyon, and that usually this happens because bears smell food and cannot resist the temptation of going after it, so they expose themselves. 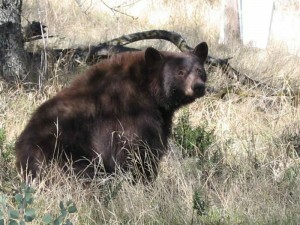 A black bear takes a peek near the foothills (Photo courtesy of the National Park Service). According to Helling, mountain lions might also be spotted on the ridges but this is very rare. “I’ve seen their tracks, but I’ve never seen them in person,” he said. Michelle Fidler, park ranger and spokesperson for Sequoia and Kings Canyon National Parks, also explained that although bears are the California symbol and should be seen everywhere, they only come around once in a while. Black bears are known to be unaggressive and extremely intelligent, knowing how to hide and efficiently avoid or escape danger. Fidler said that fear of people is natural and healthy in bears, however, due to the fact that bears are facing temptation caused by food in cars, tents and bags they are loosing this instinctive fear and this is bad for their species. “Food should be stored in bear-proof containers. Bears have become so addicted to it that cars and doors won’t stop them. We are encouraging visitors to be conscious because we don’t want to relocate bears due to trouble. It’s not fair for them,” said Fidler. However, anything is possible in such tremendous parks. In case of spotting a bear she suggests visitors should avoid all contact. “If you see one, keep your distance. Don’t go after or near them,” she said. Dawn Ryan, park ranger at Sequoia and Kings Canyon National Parks, explained that black bears, also known as Ursus americanus, are the most predominant type in the park. She stated however, that they are slowly loosing their natural instincts of keeping themselves hidden, and that human presence influences their diets. 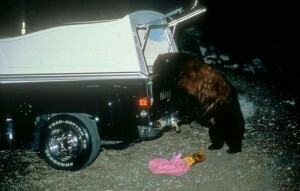 A curious bear breaks into the back of a car searching for human food (Photo courtesy of the National Park Service). Ryan explained that bad habits are passed on from generation to generation and things like these could eventually ruin the nature of the bear species, that is why it is important to avoid feeding any type of wildlife within the park. Sequoia and Kings Canyon National Parks have developed a hazing program that cautiously and respectfully teaches bears the consequences of stealing human food, by trapping them in cages for days, in order to prevent them from coming back or nurturing their cubs into believing stealing is good. “The lure of food is too much, so if they cannot get access to food in the first place, then that’s best,” said Ryan. According to Chip Erikson, ranger at the Foothills campgrounds and wildlife specialist, bear sightings are most frequent during the later summer months when they are eating in preparation for winter hibernation. However, bears are not the only animals roaming around. If lucky, visitors could spot ground squirrels, ringtail squirrels, foxes, coyotes, mule deer, birds, western fence lizards, alligator lizards and even different varieties of snakes. 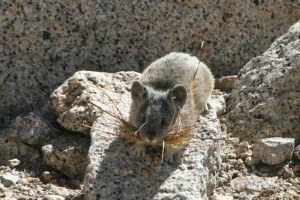 A young pika collects hay near the protection of the rocks (Photo courtesy of the National Park Service). Among the different types of snakes visitors could encounter are rattlesnakes, gopher snakes, king snakes, garter snakes and the tiny ringneck snake. Although rattlesnakes are common findings in lower campgrounds, Erikson confirms rattlesnake bites are not. “Rattlesnake bites are extremely rare. A good place to see snakes is near the river, as it is a good place for them to hunt,” he said. Sequoia National Park is also home to a variety of migratory and resident birds such as the hermit thrush, the western bluebird, the pileated woodpecker, the western tanager and many others. The high-country, the meadows and the lakes are areas mostly inhabited by the bighorn sheep, the marmot, the pika and the white-tailed jackrabbit. But the biggest question most visitors ask is not what type of wildlife the park has. Instead, how to actually encounter it. Most bear encounters occur above 4,000 feet and, in order to witness other members of the wildlife, Erikson suggests venturing into the deeper and more unexplored parts of the giant forest. “A good strategy to see animals is to hike. Some animals like to come down and try to get food around the campgrounds, but most of them are very secretive and shy,” he said. So, if visitors wish to experience a much lively and buoyant wildlife scene, they should dig deeper into the silence indeed. Silent areas equal tranquility, and tranquility equals chirpy species in the farthest areas of Sequoia and Kings Canyon National Parks.